Black Friday, the busiest shopping day of the year, has become a traditional day of 'great deals' and millions of cash transactions. One day after being 'thankful' we rush out to buy mountains of things. But this year, will you also consider investing in saving America's oldest mountains? Of all the things we can give during the holidays I can think of no gift for our children more valuable and lasting than protecting Appalachia. Monarch butterflies migrate from Canada to Mexico along Appalachian ridges, cold streams tumble over moss-covered rocks, and thousands of trails snake through forests where animal and plant species that exist no other place on Earth are found. 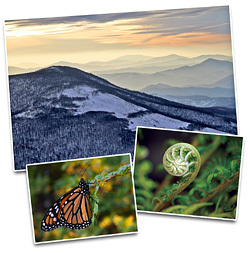 More than 1.4 million acres of this natural wonderland have already been destroyed by mountaintop removal coal mining. If considered as its own country, the southeastern United States ranks sixth among nations for greenhouse emissions due to burning coal to produce electricity. We are the nation that has walked on the moon — we can do better. Appalachian Voices needs your help to end mountaintop removal forever and transition the Southeast from coal to a clean energy future. It's not rocket science, but it takes money to fight 'Big Coal.' They've invested millions in maintaining the status quo. Will you invest the cost of a sweater in protecting our mountains? Tell President Obama: No More Excuses! 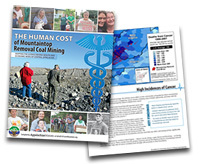 Help Stop Another Bad Coal Ash Bill! Looking for unique holiday gifts? 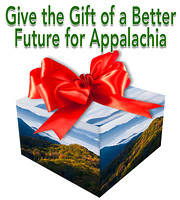 Invest in change -- give a gift membership to Appalachian Voices and help us continue our work toward a cleaner future for Appalachia. A special exhibition of Appalachian photography by Rachael Bliss is on display at the Grateful Steps Gallery in Asheville, N.C. now through Nov. 30 -- and a portion of sale proceeds will be donated to Appalachian Voices! Dec. 7, 8 a.m. - 6 p.m.: A day-long forum focused on local entrepreneurship opportunities across western North Carolina, including food to fiber, energy to technology, and beyond. Sponsored by the Blue Ridge Entrepreneurial Council. Asheville, N.C.
Dec. 12: Discuss Stan Cross' long-range vision to incorporate sun-powered electric car charging stations and electric rental vehicles into the local tourism industry. Asheville, N.C.
Dec. 14 - Jan. 5: Volunteers observe and count birds over a 24-hour period in a massive citizen science effort for bird conservation. Find a count near you. Every Saturday through March: Featuring 20 road races and one trail race varying from five to 13 miles/ Walkers are welcomed. Held in various state parks throughout Tennessee. Check out our full calendar of environmental goings-on! Boone, N.C. • Charlottesville, Va. Raleigh, N.C. • Knoxville, Tenn.